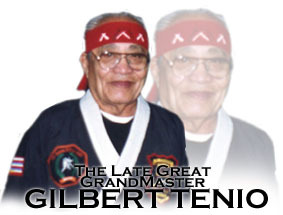 Gilbert Tenio was born on July 12th, 1918 in Day Duero, a village on the island of Bohol, in the Philippines. 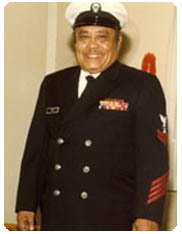 At 26 years of age he became a naturalized citizen of the United States, making his home in Stockton, California. 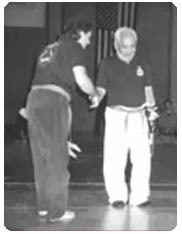 Grandmaster Tenio started his martial arts pursuit as a young boy around the age of 5. It has been said (but not confirmed) that his mother was an inheritor, or Suta of the DeCuerdas System. In the Vasayan dialect Suta means ruler of the mountains and wilderness and is used to refer to a spiritual medicine healer similar to a Huna in Hawaii. As a child young Tenio was a bit of a hot head and in the Eskrima world a true hot head is not allowed to be taught the teachings. Before a student can be taught the higher teachings the master must feel a student’s head in a certain way in order to determine how the student would use his art: If a student cannot control his temper he should not be trusted with an art that can hurt others. Gilbert was on the line (or as he said, over it!) but his mother had chosen him as the one to carry on the family teachings. Trying to help balance him she sent him to other martial arts schools that included Judo, Jujitsu and Karate. He earned his first Black belt at a very young age. Then while in the military service he had the opportunity to train with ‘Cat Man’ Yamaguchi and received the rank of Yondan from him. 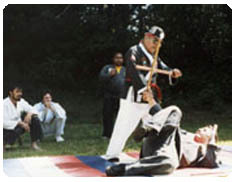 He taught Karate-style martial arts in the military and at the base had a small dojo but he kept his Eskrima mostly to himself. In the old days most all martial arts were a great mystery to people outside of Asia. In those days the teaching of the martial arts was more territorial and someone who wanted to prove their own worth often showed up to challenge an instructor. Having two instructors in the same area was both bad for business and bad for the ego so challenges were a normal thing. 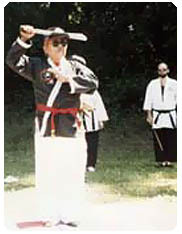 Master Tenio welcomed these as extra training opportunities since he had been training all of his life and was quite confident in his abilities (plus he had his Eskrima which he kept as his ace in the hole). So he hung a sign on his dojo beam, “All challenges accepted” – and get them he did! He told me of a table that he kept near the entrance with weapons on it. 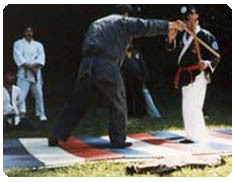 When a Karate guy would come in to challenge him he would say, “Choose a weapon and I will be right with you.” This is not what a Karate guy would have in mind: he wasn’t expecting a blade fight and most of the time he would then try to talk his way out of the challenge. In the end Master Tenio would always prevail and do his best to teach them a strong lesson without hurting them too badly. 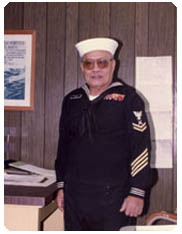 Gilbert was a strong but also a very kind man. Whenever he would put on his red headband I would want to run in the other direction, because on those days the warrior in him would come out. His whole facial expression would change from a sweet man to the Terminator. The lessons were strong, hard and, well, let’s just say they hurt in a way that they were never forgotten. He was giving us gifts and he was determined that we were going to watch, listen and learn. Then, after he made his point and class was over, he would take his headband and uniform off and the biggest smile in the universe would come out. Happy with himself and with us he would often exclaim with enthusiasm, “Let’s go eat Chinese food!” We would all agree with pleasure, happy that we had survived the training. There were other days that though we would attempt our best to do what he was teaching us, we would be far from perfection. Yet, as long as it worked and we could not get hurt doing it he would simply say, “I’ll buy that,” sometimes adding “What else have you got?” This was his way of saying that we were at least getting a part of what was being taught. He was never in a hurry for us to learn. 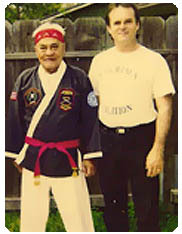 Great Grandmaster Tenio became good friends with Professor Wally Jay of Jujitsu America after they met while both teaching at Camp Danzan Ryu, held in the Santa Cruz Mountains. They developed a long and deep friendship. 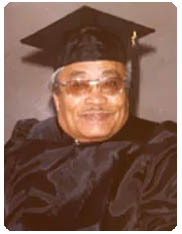 After teaching at a Reno, NV worldwide convention and showing counters to most every high level Jujitsu technique known, Grandmaster Tenio was recognized as the Jujitsu ‘Man of the Year.’ Master Tenio was also awarded and inducted into Black Belt Magazine’s Hall of Fame for his contributions as a teacher to the martial arts. 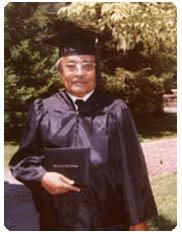 Master Tenio studied philosophy and psychology, among other things, at San Joaquin Delta College, earning a general arts degree. 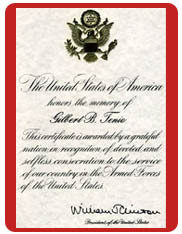 Because of his devotion and service to his country, at the time of Grandmaster Tenio’s passing President Bill Clinton sent the family a certificate of the US Government’s appreciation for his selfless service to the armed forces and the United States. He was survived by his lovely wife Shirley. Master Van Donk congradulates GM Tenio on large tourneyment Demonstration of DeCuerdas.